It is now easier to log into your handset by using your Connect app. QR Code Handset Login allows you to use your Connect app to scan a code on your handset display, and be logged in to your phone immediately. The Connect app is available for both iOS and Android. Please make sure you have the most up to date version of the app. This feature can be turned on for all handsets at a site. Once switched on, all phones will display a QR code after they have been logged out. If the handset is already logged out, it will need to be rebooted. Please note that if the QR feature is switched on, it is not possible to apply a different custom background to the logged out handset screen. Talk to the essensys team today to turn this service on at your sites. 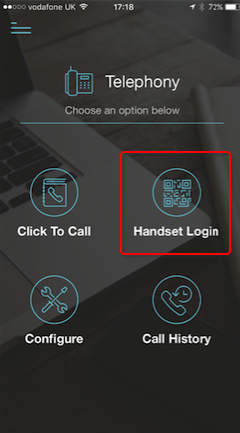 Log in to your Connect app, and select Handset Login. Your device's camera will be turned on. Position the camera over the QR code on your handset. Once the code has been scanned, the handset will begin to log in.